Vitamin D plays an important role in bone health, and research shows that it’s essential for immune health as well. Older individuals who are deficient in vitamin D tend to have lower immune function, finds a new study in the Journal of Endocrinology & Metabolism. The study of more than 900 people who were at least 60 years of age examined vitamin D levels as well as biomarkers of inflammation. Those whose blood levels showed a deficiency of vitamin D were more likely to have high levels of inflammation biomarkers, which are linked to inflammatory conditions like rheumatoid arthritis as well as heart disease. 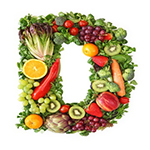 Research shows that vitamin D deficiency is widespread in the U.S., with some studies showing at least 50 percent of the North American general population having low levels of this important vitamin. To determine whether you’re deficient, ask your healthcare practitioner for the blood test for 25-hydroxyvitamin D3, or 25(OH)D3. For optimum health, blood levels should be between 50 to 80 ng/mL.